When it comes to women in the technology industry, we are facing a massive crisis. With millions of tech jobs available, tech companies can’t hire talent fast enough; yet in a survey of over 2,000 A-Level and university students conducted by Women in Tech, only three percent of females said a career in technology was their first choice. What’s even more distressing is that only 16 percent of females had a career in technology suggested to them, as opposed to one-third of males. However, many companies like TradeRev are trying to shift this trend because as Reshma Saujani, CEO and founder of Girls Who Code, said, “Computing is too important to be left to men.” With this in mind, let’s explore why it’s so important to encourage women to pursue careers in tech. In the U.S., over half of the workforce is made up of women, but only 28 percent of proprietary software jobs are held by women, with the number dropping further to 25 percent in IT. What we’re seeing is a large discrepancy in the number of women in the workforce compared to the number of positions in the tech industry. This is undoubtedly leading to a point in which there’s going to be more technology-focused roles than the tech workforce can support. In fact, the U.S. Department of Labor projects that by 2020, there will be 1.4 million computer specialist job openings. 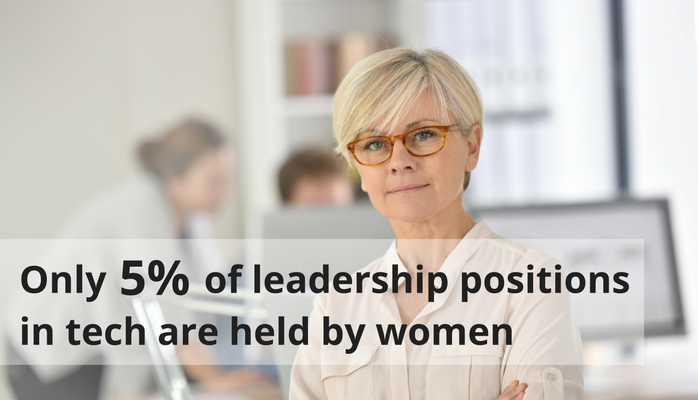 In order to balance the gender disparity, women must fill half of these positions (700,000 jobs). With this in mind, data tells us that an average of 30 percent of students with exposure to computer science will continue in the field. This means that 4.6 million adolescent girls will require some form of exposure to computer science education to fill the 700,000 computing jobs due for 2020. So how do we encourage women to pursue an education and career in technology? Well, the answer is actually quite simple: keep them engaged. According to Girls Who Code, 74 percent of girls in middle school express interest in science, technology, engineering, and math, but after fast-forwarding only a few years, just 0.4 percent of high school girls select computer science when choosing a college major. Somewhere in adolescence there is a disconnect. Perhaps it’s an inherit perception that technology is a masculine field. After all, 78 percent of students today can’t name a famous female working in technology. So, in order to keep women’s interest in the industry, we must inject more tech focus into school curriculums and support more networks like Ladies Learning Code. By keeping adolescent girls interested in technology, we’ll be able to fill the workforce gap and foster the next generation of innovation. From a business standpoint, one of the most important reasons to ensure more women enter the technology industry is that gender diversity breeds success. Studies have shown that gender diverse companies experience more success. This means that a tech company without a balanced representation of women cannot grow to its full potential. McKinsey reports that companies in the top quartile for gender diversity are 15 percent more likely to have financial returns above national industry medians. Furthermore, Women Who Tech found that Fortune 500 companies with at least three women directors saw an average return on equity increase by at least 53 percent, a return on sales increase by at least 42 percent and a return on invested capital increase by at least 66 percent. The statistics don’t lie; simply put, a tech company with gender parity will always outperform an unbalanced one. We need to change the perception that technology is a masculine field by providing young women with female role models, and giving them hands-on experience with all different kinds of technology. Great organizations such as Women in Tech, Girls Who Code, Ladies Learning Code, Women Who Tech and TechGirlz are inspiring young women to explore the possibilities of technology and shift the industry’s masculine perception. With only 5 percent of leadership positions in the technology sector held by women, once this shift occurs at a grassroots level, it will then be up to businesses to embrace this change. This will ultimately lead to an industry even more enriched with innovation, creativity and above all else, diversity.